I love outsider stories, especially outsider-in-America stories -- the stories of characters that show up in places central casting would never expect them to be. Same for the stories of characters that have every right to be someplace, yet face resistance from those who fear them. Belonging and unity can be such elusive goals and many of us face aggressors who question our right to exist on an equal plane -- or our right to exist, period. I love seeing their lives made visible on the page. But I need strong storytelling. Compelling narratives that keep me reading and pulled through with that invisible, pleasurable force. I want to be irritable if I misplace a book, or place it in the wrong bag, because I want to finish one story and begin the next. 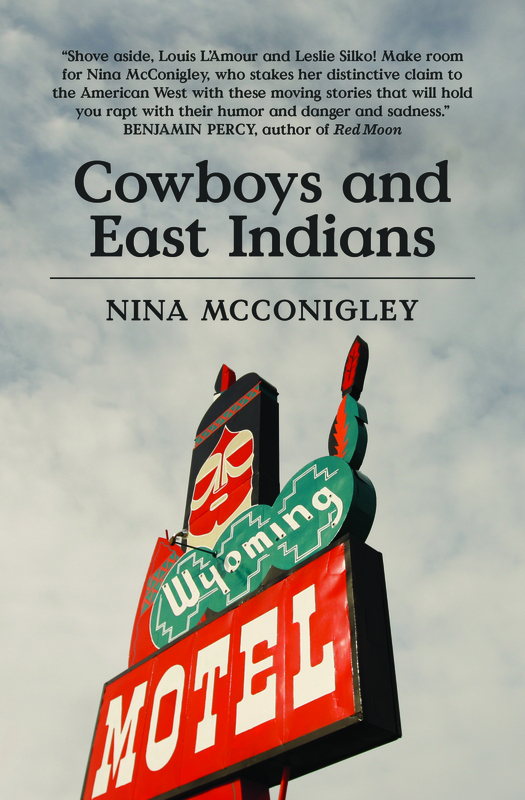 Let me tell you: I was irritable when I temporarily misplaced Nina McConigley's short story collection Cowboys and East Indians (FiveChapters). Had at least five other books placed down open-faced and I was still trying to find her book before I had to leave the house in the morning. McConigly, herself born in Singapore and raised in Wyoming by an Irish father and Indian mother, tells the profound stories of characters, who through birth or recent immigration, found themselves in Wyoming, or leaving Wyoming for travel abroad to India. Most of her characters in these stories are outsiders -- Indians in America, Anglo Americans or American-born Indians in India. But there is nothing predictable about their story arcs -- or, when consequences do arrive, they may have been foreseeable, but usually in hindsight, as you expect from an excellent story. And you may still be breathless from the cruelty, or profundity, of it all. I think of the Indian wife Madhu in "Fenced Out," who loves her life back home, but her husband, competitive with the brother who is also in America, insists that she and the children join him in Wyoming. Not long after the reunion, they are in a car crash, one that renders the wife quadriplegic. The turns of this story are unexpected and haunting, especially the ending, one that illuminates and shakes our assumptions about the important geography of this story, or any story. And I am still thinking of the white Caspar co-worker in "Pomp and Circumstances" who wants Chitra, the Indian wife of his colleague, to come to his home and go down to his basement. Not for seduction, and not to admire the taxidermy or the gun collection, but to be allowed inside the even more secret vault, the one that hides his dresses and make-up. He is a cross-dresser, and he wants to try on one of her saris. This is their secret, one that Chitra will keep. For even she knows: "This kind of thing can get you killed in Wyoming." To be honest, I am still thinking about many of the stories in this collection -- thinking about powerful moments and the fates of characters. I decided to ask McConigly if she would speak to me more about growing up in Wyoming, about storytelling and writing, and about her sense of home, and about her Irish side (too!). As with her fiction, there is much in her biography and point of view that doesn't stick to presumed scripts. Tell us about home. Has your sense of home shifted, or evolved, over time? I think for a long time growing up, while I loved Wyoming, I always wanted to be somewhere bigger, I always wanted to live in a city. As an adult, I have tried to live in cities before. I always thought cities were where it was at -- museums, restaurants, music... and people. So many different kinds of people. But over time, I have realized I am not a city person. I love the quiet. The open space. The mountains. The extremes that Wyoming presents. I am most at home when I am here. I write well, and I perhaps work harder here to have the life I envisioned when I was younger. I may live in the least populated state, but I don't feel like home is lacking. I feel so full and blessed here. Less people yes, but the people here are all a different stock. A tough astonishing group that have chosen to make a life in the American West. You were born in Singapore, but grew up in Wyoming. What were the blessings of such an upbringing? And the pitfalls? I grew up in a very international home. I think when you live in a rural or isolated place, if you are from somewhere else, you tend to find other outsiders. In our home, we had friends who were South American, Polish, German, French, Chinese... it was a long time before I realized this wasn't the norm. I think if I had grown up in a more urban environment, I may not have met the people I grew up with. The pitfalls were that I didn't much ever see a reflection of myself. I was often the only brown person in the room. I am not sure this is always a bad thing, but I became acutely aware of being a bit of an outsider. And perhaps my hackles went up. I was sure I wouldn't ever date or be in the popular crowd in high school. Do you have romantic feelings towards your father's roots? How much do you identify with his contribution to your heritage? It's strange, as no one asks me about my Irish side. I suppose that makes sense, since I visibly look Indian. But, I actually have dual citizenship -- and I am an Irish citizen and hold an Irish passport. Growing up, I spent much more time in Ireland. And in college, I focused on Irish literature. I read all the Yeats and Joyce I could. My Irish family are all great storytellers (such a cliché, but true!). I like to think I get the love of language and words from them. I may write about Indian things, but again, I think in many ways, my sensibilities are very Irish. Everyone who meets my parents often are often surprised that they are a couple. That they grew up in such radically different backgrounds and make it work. I always say, not really, both my Irish and Indian families don't really like the British -- so they have that in common. Who were the influential storytellers of your youth? Enid Blyton, LM Montgomery, and my all time favorite, Laura Ingalls Wilder. A line of hers is the epigraph to my book -- and I will always love Wilder. She's my writing hero. I am crazy about any pioneer narratives, and in fact, I have a tattoo of a covered wagon on my back. But I love that she tells a story simply and she isn't sentimental at all. Which is something to me that is essentially very true to the American West. She tells you the crops fail, that Mary is blind, that the temperature is -50 -- and then she moves on. There is no wallowing in sorrow. She personifies the expression "Cowboy Up." I also was a huge Archie Comic Book fan. In fact, the first thing I ever published was in an Archie comic. I designed clothes for Betty and Veronica. There was something so quintessentially All-American about Archie. And I really clung to that. When did you first know it was important, or rewarding, to tell stories? Were you mentored early? I always did Young Authors in school, and I have always made small books as presents for friends. But in my youth, I more read than wrote. I was a bit of a socially awkward kid, so reading was my huge escape. My mom had brought a 'swinging chair' from Singapore when we moved. It was a big bamboo kind of cocoon that hung from the ceiling by a chain. When I was a kid, I would sit in it after school and rock myself whilst reading. I knew stories could take me places, making me feel my world was very large. When, in fact, it was quite small. Growing up, when did you feel most "other" or "outsider"? When did you feel you most belonged? I always physically felt like an outsider. I didn't look like anyone else. But I think, and I think many writers probably feel this, I felt more like an outsider in terms of my empathy and the way I liked to observe everything. I was slow and thoughtful in a way that people perhaps mistook for being very daydreamy. I feel like I belong when I walk on the prairie. Nature is very fair to all. There's no judgment. How has the hometown reception been to your book of stories? Is there any felt difference in reception inside or outside of Wyoming? Wyoming has been wonderful in accepting and embracing the book. My hometown bookstore has sold almost 300 books -- which is astounding to me! Who knew? But many people I grew up with or I have known all my life have come and asked me -- "Was that what it was like growing up?" Or have said, "But I haven't ever seen you as brown, I see you as Nina." That is problematic to me in some ways, but I am happy to have conversations about race now that the book is out. Outside of Wyoming, people have been just as lovely. But who doesn't love Wyoming? In terms of states, it's an enigma. It's more "exotic" than being Indian. As a child, did you yearn to live somewhere else, or to be someone else? Fairyland. And I still want to, once in my life, live near the sea or water. Growing up landlocked makes one quite fascinated by water. What urgent advice would you give an emerging short story writer? Write a novel first. No, actually, a story collection gives you so many lenses to look at one thing, one place, one theme. It's a gift. I love that I get to talk about Wyoming though the ten stories in my book. I can cover so much ground. I am working on a novel. I am getting to the end of the first draft -- and after that, I'd like to write some more nonfiction. But the novel has been such a big part of my life this past two years -- I am not sure what I will do when it's out of my hands. But the nonfiction bug is calling. I worked as a journalist at The Casper Star-Tribune, which is Wyoming's largest statewide newspaper for many years. I loved reporting, meeting people, and telling their stories in a truthful way. I'd like to get back into that some. Who else should we be reading right now? Submergence by JM Ledgard is extraordinary -- the best book I've read in ages. 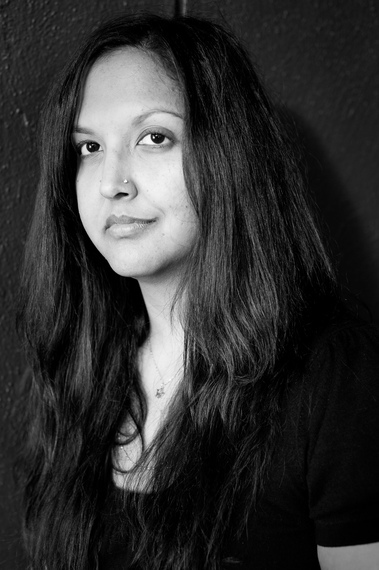 Tarfia Faizullah just published a book of poems called Seam that is stunning. I'm very excited to read Teju Cole's new novel (new to being published in the US anyway). And then in the next months, I am looking forward to Elizabeth McCracken's new collection, and novels by Julia Fierro, Ted Thompson, Porchista Khakpour, Cristina Henriquez, and Celeste Ng. And Akhil Sharma is one of my favorite Indian writers. He has a new novel out in the Spring. If we find ourselves in Wyoming, where must we go no matter what? I am not going to lie, the major sites like Yellowstone, Devil's Tower, and the Tetons are remarkable. But, I think looking for fossils in Kemmerer is magical, and if you want to experience some thing really nutty -- Thermopolis, Wyoming is for you. It has the world's largest mineral Hot Springs. You must soak, and then go have a drink in the Safari Room at the Days Inn. Hot water + taxidermy = mind blown.